Beaterblog: Marketplace Feature: Rastrojero, Spanish for "That's how it's supposed to look!" Marketplace Feature: Rastrojero, Spanish for "That's how it's supposed to look!" Ok, it actually means 'cropper' but it probably had to look that way. 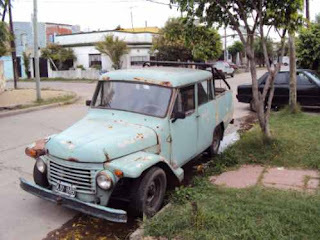 Reason being that these trucks were government-built from a warehouse full of 2,500 defective Argentinian tractors that pulled hard to the right and were hence never sold. Demand was steady so they kept making them until the late 70's when Proceso de Reorganización Nacional put the brakes on the whole operation. To top off the obscurity, they used a Borgward Diesel with a whopping 40 horsepower that eventually went in to a more refined (and stainless steel!) truck version and a sedan called the Conosur. This one is selling for about $1,500, although most of the nicer ones are in the $2,500 range. Epic road trip anyone? Go here for the ad.